Keel-laying ceremonies were held recently at Twin City Ship- yard in St. Paul, Minn., for the 3,850-cubic-foot, suction hopper dredge Ouachita being constructed for Gulf Coast Trailing Company of New Orleans. The 300-foot ves- sel will incorporate many state-of- the-art features unique for U.S. dredges, such as her propulsion and pump drive systems. The two main diesel engines will drive con- trollable-pitch propellers off their aft ends and a dredge pump and jet pump off the front of each engine through split gearboxes. The deckhouse will be located for- ward for crew comfort and is de- signed to accommodate a crew of 26 in single and double staterooms. 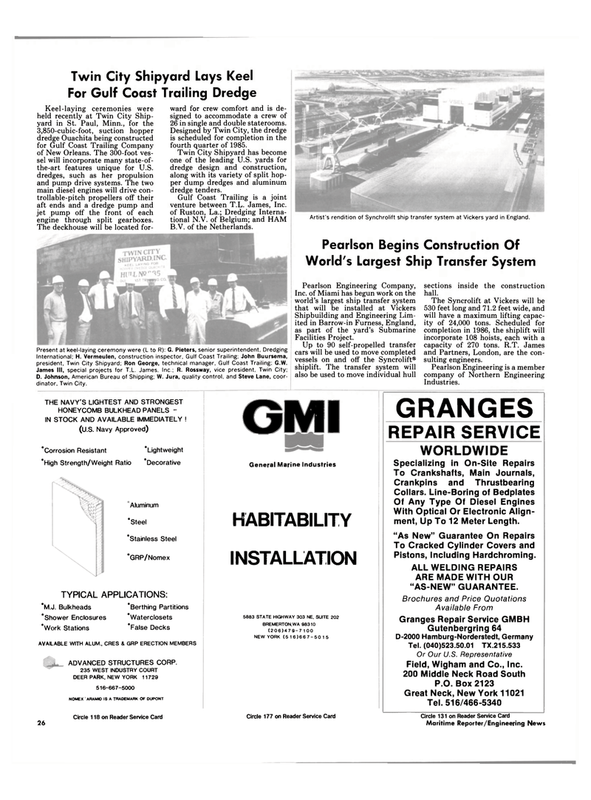 Designed by Twin City, the dredge is scheduled for completion in the fourth quarter of 1985. Twin City Shipyard has become one of the leading U.S. yards for dredge design and construction, along with its variety of split hop- per dump dredges and aluminum dredge tenders. International; H. Vermeulen, construction inspector, Gulf Coast Trailing; John Buursema, president, Twin City Shipyard; Ron George, technical manager, Gulf Coast Trailing; G.W. D. Johnson, American Bureau of Shipping; W. Jura, quality control, and Steve Lane, coor- dinator, Twin City. Artist's rendition of Synchrolift ship transfer system at Vickers yard in England. Up to 90 self-propelled transfer cars will be used to move completed vessels on and off the Syncrolift® shiplift. The transfer system will also be used to move individual hull sections inside the construction hall. The Syncrolift at Vickers will be 530 feet long and 71.2 feet wide, and will have a maximum lifting capac- ity of 24,000 tons. Scheduled for completion in 1986, the shiplift will incorporate 108 hoists, each with a capacity of 270 tons. R.T. James and Partners, London, are the con- sulting engineers. ARE MADE WITH OUR "AS-NEW" GUARANTEE.